Working as Administrator with Active Directory can be rewarding. You can easily deploy new settings, make changes to users even on largest scope. Whether it's 10 people company or 100000 people company there are benefits on having Active Directory in place. One of the challenges for Active Directory is knowing how to monitor changes to it. While you may think that when you're lone wolf working as a main Administrator you don't need to monitor your Active Directory it may not always be the case. Things get even more complicated with more Administrators having access to your AD or Service Desk agents having some access rights to part of it. Recently one of our Clients asked us if he can receive daily, monthly and quarterly reports of changes that happens to users and groups. He is required by law to know if our Administrators are doing their job with proper procedures in place or they just run headless creating accounts and giving access to sensitive data. While there are many products on the market that can provide this kind of monitoring or even scripts that monitor Group Membership Changes like the one from Lazy Win Admin which I've initially used to try things out but they were lacking one small thing – who did the change and when. Both have their pros & cons and from what I've seen on the Internet there are many options to monitor it the first way, but then you lack some of features. 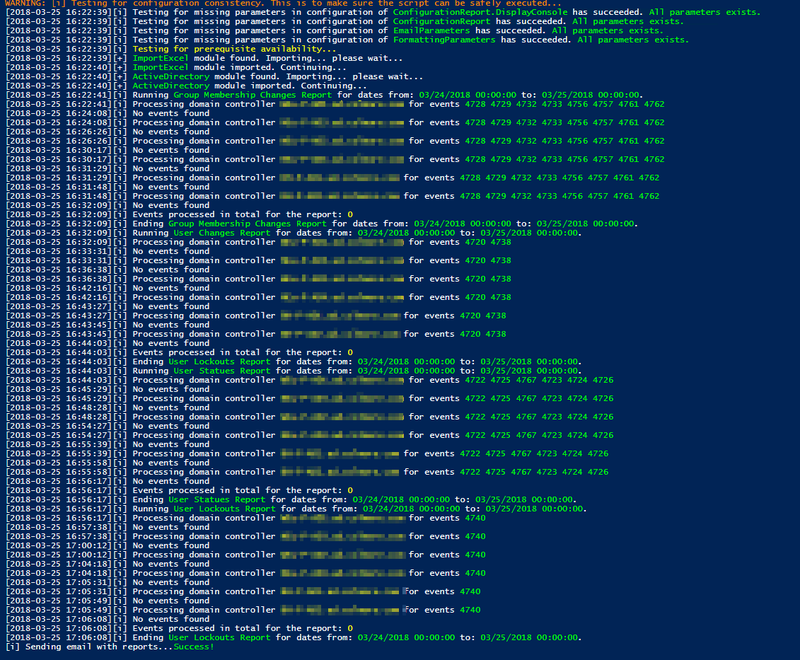 Setting up PowerShell Script (attached below) as Task Schedule (Get-EventsLibrary.ps1). When you run the script following screen shows up. It means it's running. Please notice it can take a while to do the scan depending on the size of your environment. When it's done you will get an email with some nice layout of information. 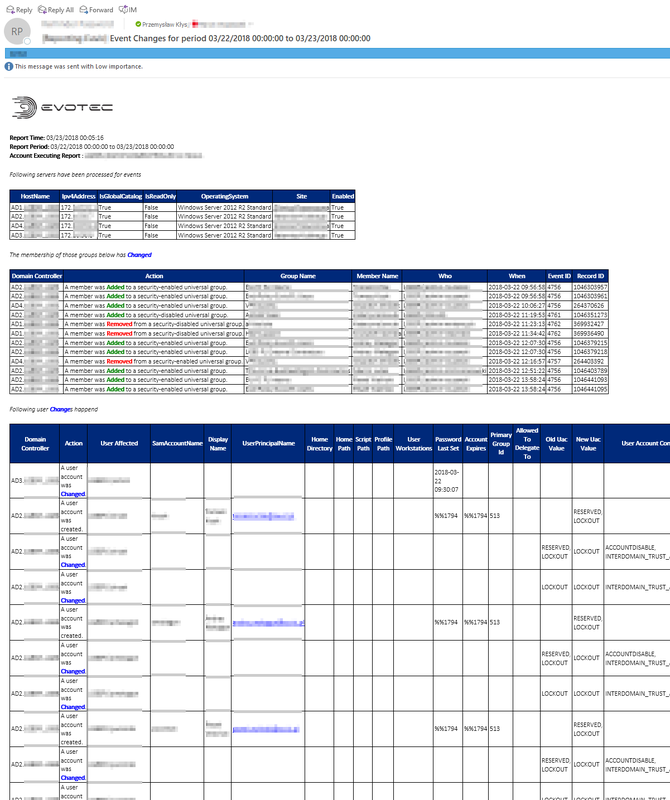 You can find a sample report generated by the script. I have removed some bits and pieces but it should give you a brief overview of what you get. Best of all it's free. This solution consists of 2 scripts. So called configuration and starting script (Get-Events.ps1 – you can call it however you like thou) and the real deal Get-EventsLibrary.ps1 that does the heavy lifting. The idea behind splitting those 2 scripts, instead of using just one, is so that configuration file can store all the confidential data and the library can be easily replaced with new versions when they come out without need to edit and potentially affect deployment. You can find full code and additional description on how to configure this code on Get-EventsLibrary.ps1 page.